Back in the seventies, Thames TV looked across town at the remarkable success that the BBC was having in deleting, trashing, and wiping their early color television shows and decided they needed to get in on that action. They even found a perfect candidate for a program that lots of people really loved and would miss if they threw it out. It was called Ace of Wands, a series created by Trevor Preston in which a stage magician with psychic powers – you remember when Uri Geller was actually a comic book character in the Marvel Universe? Kind of like that – matched wits with bizarre criminals in modern London. Tony Selby and Judy Loe played his sidekicks, and his villains included Russell Hunter, Christopher Benjamin, Isobel Black, and Hildegarde Neil. Thames destroyed all of the first two seasons, the vandals. They even dumped Tim Curry’s second credited TV part. Fortunately, the third and final season of Ace of Wands was spared the ax. It aired from July through November in 1972. Michael MacKenzie was back as the adventurer Tarot, and in the first serial, “The Meddlers,” written by P.J. 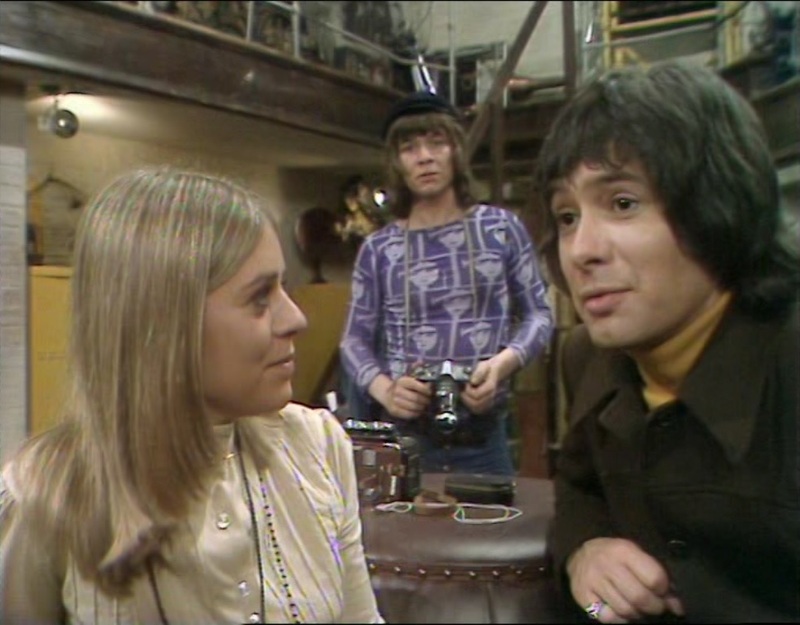 Hammond, he meets two new associates, Mikki and Chas, played by Petra Markham and Roy Holder. Michael Standing plays the leader of an unkempt street band who seem to malevolently hover over a failing urban market, where fires break out, goods are smashed, and vegetables rot before they should. Rumor has it that a man had been killed there a hundred years ago and placed a curse on the land. Or is there a more real world reason for all the unhappiness and violence? I didn’t dare ask our son whether he enjoyed it. This is a very slow opener, with very little action, and what action we do see is pretty incompetently staged and edited. Nothing is very strange and certainly not scary, and the whole affair violates the “show, don’t tell” rule to absurd degrees. This episode doesn’t work well, but the engaging characters and realistic mood promise better things. Indeed, better and weirder is definitely to come. In fact, the thing that generated the most enthusiasm was a strange decision by the set designer. There’s a high-rise towering over the market, and a shadowy man on the top floor keeps an eye on the stalls through binoculars. He has a desk, and he keeps a python in a birdcage, but he has no other furnishings. There’s so much empty space that our son suggested that he could play tag in the man’s office. I’m so glad you agree with my verdict on Ace of Wands. I was so disappointed when I watched it, largely because I had allowed the hype to get my hopes up. I actually feel that ‘slow’ doesn’t begin to describe it! I first saw this series as nth-generation copies in the VHS tape trading days, and got the six stories from probably four different people over the course of a couple of years, and watched them out of order. I started with “Peacock Pie,” the third story, and it is much, much better than this. Had I started with this serial, I may not have continued!